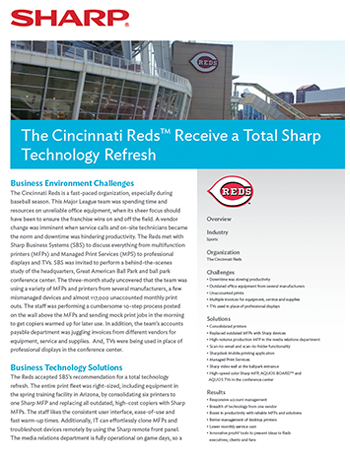 Cincinnati Reds Refresh with Sharp | Industry Analysts, Inc. When the Cincinnati Reds needed a better way to save time and money, Sharp consolidated the Cincinnati Reds existing six printers into one multi-functional printer (MFP) that could be controlled by smart phones and tablets. As a result, maintenance costs were reduced by $260 per month and the staff now has an easy-to-use consistent user interface. When baseball fans enter the Great American Ballpark, they are greeted with a high-definition 3X3 video wall made up of (9) Sharp 60” class ultra-slim bezel monitors. Additionally, the ballpark’s new conference center now uses a high-speed, color Sharp MFP, Sharp AQUOS BOARD™interactive display system, and AQUOS® TVs.